When it comes to global active smartphones, Samsung and Apple had a collective market share of more than 50% for years. That changed in September 2018, when the two tech giants made up 49.9% of the global smartphone market. While the companies still have a duopoly, our Global Smartphone and Tablet Tracker shows that their collective market shares dropped from 52.3% in September 2017 and 56.5% in September 2016. This is because Chinese brands Oppo, Huawei, Xiaomi, and Vivo are slowly but surely increasing their respective market shares. Chinese manufacturers accounted for more than 1.2 billion of the world’s active smartphones in September 2018. Earlier this year, we correctly forecast that the number of Chinese smartphones would exceed 1 billion by the end of 2018. 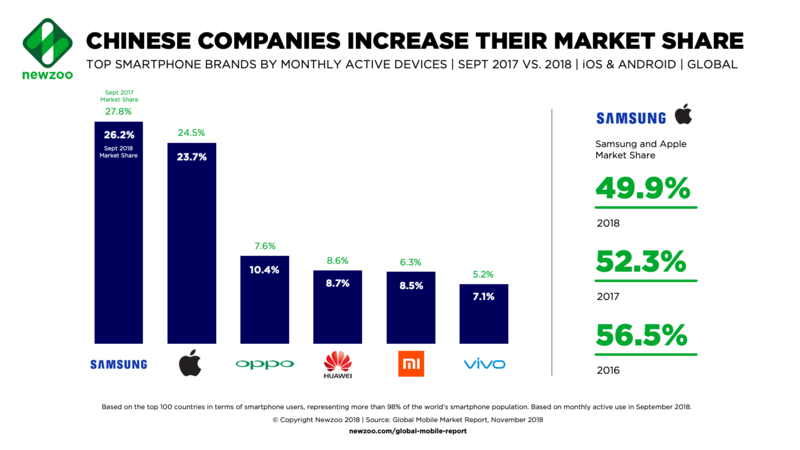 In September 2018, the two most popular brands by active smartphones were Samsung and Apple, with market shares of 26.2% and 23.7%, respectively. Two years earlier, Samsung had a market share of 30.6%, while Apple had 25.9%, so the effect of the growing Chinese companies is more visible for Samsung. The #3 brand was Oppo, which had a market share of 10.4% in September 2018—compared to 7.6% in September 2017. Oppo’s most important market is its home country, China, where 72.3% of active Oppo smartphones were located. However, India (11.2% of active Oppo phones) and Southeast Asian countries such as Indonesia (4.6%) are becoming increasingly important for the Chinese manufacturer, helping it increase its market share. Oppo’s reliance on its home market is in stark contrast with competitor Huawei, the #4 brand globally, with a market share of 8.7% in September 2018. Huawei is focusing more and more on countries such as Russia (3.8% of its active smartphones), Italy (3.1%), and Germany (2.9%). Impressively, less than half (42.4%) of Huawei’s active smartphones were located in China in September 2018. Xiaomi was the #5 brand, boasting a market share of 8.5%—an increase from the company’s 6.3% market share in September 2017. In Q3, Xiaomi was more reliant on India than ever before. A remarkable 33.2% of Xiaomi’s active smartphones were in India, compared to its 37.8% active in China. Vivo is the #6 brand, with a market share of 7.1% (up from 5.2% in September 2017). Although Samsung’s and Apple’s respective market shares are decreasing, the two companies are still performing well, increasing their total number of active smartphones on the market. Despite a relatively slow start, the latest Samsung flagship smartphones (Galaxy S9 and S9 Plus) fared better in Q3, when they were world’s fastest-growing models. Meanwhile, Apple’s smartphone installed base also increased between Q2 and Q3 this year. Two of Apple’s new flagships (iPhone XS and XS Max) were released at the end of the quarter, with the third (iPhone XR) launching in October. Q4 is due to increase Apple’s installed base even further.